Enum. Cact. (Pfeiffer) 85. 1837. Accepted Scientific Name: Stenocereus griseus (Haw.) Buxb. Origin and Habitat: The native distribution of Stenocereus griseus is in coastal Venezuela in the Falcon-Lara complex. Also in the intra-Andean arid patches of Táchira, and Mérida states and adjacent islands, but now subspontaneous and broadly naturalized after abondoned cultivation throughout Mexico (Guanajuato, Guerrero, Jalisco, Nuevo León, Oaxaca, Puebla, Querétaro, San Luis Potosí, Tamaulipas, Veracruz, Yucatán), Colombia, Netherland Antilles (Bonaire), Curaçao; Aruba; Sint Eustatius and Saba (Saba, Sint Eustatius); Saint Martin (French part); Sint Maarten (Dutch part); Trinidad and Tobago. Habitat: Stenocereus griseus occurs in tropical deciduous forest and xerophyllous scrub with Prosopis. The species is widespread, abundant, and there are no major threats. It also grows in huge numbers in the dryer zones of the Caribbean Rim, where plants may reach 10 m in height and grow in dense thickets. It is so common as nearly to be a weed in the desert scrub of Aruba, Bonaire, and Curacao of the Netherlands Antilles, where it grows both wild and cultivated. The plants are also commonly planted around homes and gardens and are tolerated on agricultural lands, meaning that plants are left when the vegetation is cleared for agriculture. Ecology: Its fruits have an ecological role; they are consumed by invertebrates and reptiles, birds, bats, and flightless mammals. The species is interesting from the point of view of seed dispersion syndromes because its pulp may exhibit two colours within the same population: blood red and greenish white, corresponding to ornithochory (seed dispersion by birds) and chiropterochory syndromes (seed dispersion by bats) respectively. Cereus clavatus Otto & A.Dietr. Stenocereus deficiens (Otto & A.Dietr.) Buxb. Cereus deficiens Otto & A.Dietr. Ritterocereus deficiens (Otto & A.Dietr.) Backeb. Cereus eburneus var. polygonus Pfeiff. Stenocereus victoriensis f. cristatus hort. Cereus eburneus var. monstrosus Bonpl. Description: Stenocereus griseus is a treelike cactus (3-)6-9(-10) meters high, sometimes branching at the base, sometimes with a definite trunk. This species shows latitudinal variation in growth form, from a multi-stemmed shrub sending up from the base 5 to 20 branches 3 to 6 meters high in dry northern habitats to a ten metre columnar arborescent cactus in Caribbean deciduous forest. The flowers, which appear in spring, are followed by the large delicious fruit much prized by the native. Stem: Trunk up to 35 cm in diameter, smooth when old; branches erect, 9-12 cm in diameter green and more or less glaucous. Ribs: 6 to 10, bulging below each areole. Central spines: 1-3, to 15 mm long but the longer ones 4 cm long. Radial spines: 6-11,6-10 mm long. Flowers: Flower-bud obtuse or rounded at apex, covered with overlapping scales, these obtuse and brown; flowers broad funnelform, with reflexed perianth parts, pinkish, 7-10 cm long; inner perianth-segments white; style exserted before the flower opens. Blooming season: Stenocereus griseus blooms in spring the flowers open at night but lasting until midday. The time from of flowering to fruit maturation is relatively short. Fertilized flowers give rise to mature fruits 40 to 50 days after pollination and fruit development start earlier, and fruit ripening occurs at the end of the spring, but flower development is asynchronous. Namely, flowers in early stages of differentiation, flowers at anthesis, and young developing fruits can occur simultaneously. The asynchronous patterns of flower and fruit production may be especially advantageous during adverse environmental conditions. Also Stenocereus griseus may have a second blooming later in season. Fruit: The fruits are almost spherical to oblong, and are catalogued as “dehiscent fleshy fruits”, they are about 5 cm in diameter, spiny, perianth parts not persistent, edible, the pulp blood-red or greenish-white. S. griseus produces red or white fruits nearly on 1:1 ratio. 2) Forest & Kim Starr “Stenocereus griseus (Mexican organ pipe)”. Plants of Hawaii. <http://www.starrenvironmental.com>. Downloaded on 20 August 2014. 8) Arreola, H. & Nassar, J. 2013. Stenocereus griseus. The IUCN Red List of Threatened Species. Version 2014.2. <www.iucnredlist.org>. Downloaded on 25 September 2014. 10) Wikipedia contributors. "Stenocereus griseus." Wikipedia, The Free Encyclopedia. Wikipedia, The Free Encyclopedia, 5 Oct. 2013. Web. 25 Sep. 2014. 12) Bravo-Hollis, H. “Las Cactaceas de Mexico” Vol. I. Me?xico: Universidad Nacional Auto?noma de Me?xico.1978. 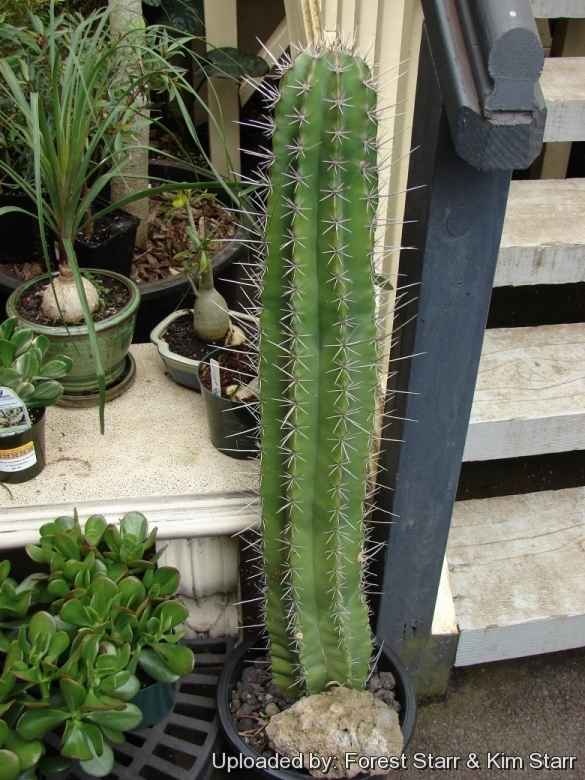 Cultivation and Propagation: Stenocereus griseus is easy to grow but not cold hardy . Growth rate: It produces good amounts of growth each year if kept well fed and watered throughout the warmest months, particularly if it has been acclimatised to accept full sun. It will make clumps given the best conditions. Soils: It likes very porous fertile cactus mix soil. Hardiness: Reputedly sensitive to frost , but less so if kept on the dry side prior to, and during, cold weather (hardy to -0° C for short periods). However warmth throughout the year will increase the grower's success (8-12°C during rest season). During winter month, put them in a cool luminous place and encourage them to enter winter dormancy by withholding water and fertiliser over the winter as they will etiolate, or become thin, due to lower levels of light. Exposition: Outside full sun, inside need bright light, and some direct sun. Tends to produce a dense white bloom in strong light, which encourages also flowering and spine production. Garden uses: It is an excellent plant for container growing. It always looks good and stays relatively small. It look fine in a warm greenhouse and frame or outdoor in a rockery. It is commonly cultivated for living fences in tropical and subtropical America (especially in Mexico). Uses: Stenocereus griseus is widely used as: food and beverages for people (roasted buds, fresh fruits or fermented fruit juice), feed for goats, living fences, building material, water purifier, medicine, and as an ornamental plant. The fruit is known in Mexico as "pitaya de mayo" and in Venezuela as "dato". In San Luis Potosí and Tamauliapas this fruit is used and commercialized locally. There are managed cultivations, but in many places the harvest is from wild populations. This harvest does not affect wild populations. In Venezuela, it is sold along roadsides within its area of distribution. The pulp has the potential to be used in the production of wine and marmalade. The wood is rich in potassium and is, therefore, used as a fertilizer. - Rot: They are susceptible to fungal diseases if overwatered, but are not nearly as sensitive as many other cacti, especially in warm weather. If kept damp through cold periods, they will invariably suffer. 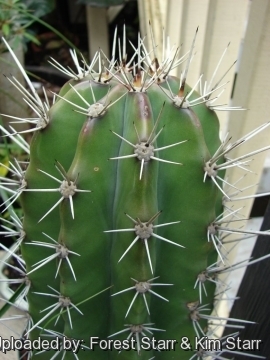 However rot is only a minor problem with cacti if the plants are watered and “aired” correctly. If they are not, fungicides won't help all that much. Propagation: Division, direct sow after last frost. The seeds of Stenocereus griseus are quite easy to germinate and grow and maintain their viability alter 12 months of storage, reaching germination percentages of 90 to 100% four days alter sowing. Germination is inhibited as long as the seeds are embedded in the pulp but is high for cleaned seed. The seeds require light and germination is somewhat enhanced at hight temperature (35°C and 40°C) and depressed at 20°C. Remove the glass cover gradually as the plants develops and keep ventilated, no full sun for young plants! To make a cutting twist off a branch and permit it to dry out a couple of weeks, lay it on the soil and insert the stem end partially into the soil. Try to keep the cutting somewhat upright so that the roots are able to grow downward.